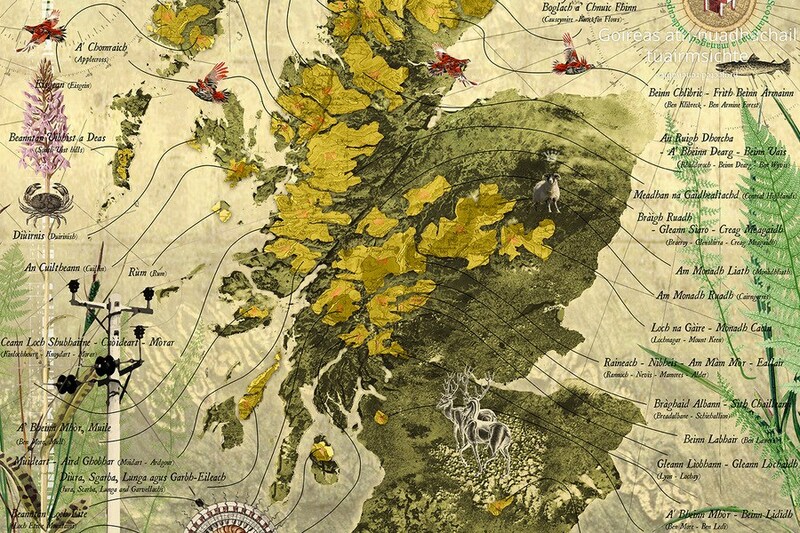 The skeleton of Scotland— its bens, glens, and lochs — were shaped by the brutal cleaving of the earth by glaciers; the deformities and scars reflecting the ruthless devastation wrought by Earth’s fury. There was no malice in how the world was shaped, it just Was. The flesh atop those bones is an entirely artificial construct, formed over thousands of years. Mankind has long been able to overpower nature — we can level mountains, wipe species from the Earth, consume forests, and bend the world to our will: Highland and Island Scotland is no exception. What we perceive as “wilderness” in Scotland is as artificial as any cityscape. Mankind’s need for food turned what once were forests to barren hills and farmland, but visceral greed has been the primary influence for what followed in recent centuries. Where now, in so much of Scotland, there is emptiness and fallow land, there once were families, communities, and culture. Working class people were forced from their homes and communities over decades, be that by force of militia, fire, and hound; or poverty and famine. Vast swathes of land were cleansed of humans; replaced with sheep for food and grouse for the whims of the wealthy. That so much of the country remains this way after so many years is not a result of nature’s wrath but the choices of landowners, businessmen, and politicians. Where once the thoughtless efficiency of nature carved up the world, the businessman now hammers its face into shape. As I sat on the five-and-a-half hour train from Glasgow to Mallaig, I watched the open-cast grave of a way of life roll by; reduced to rubble and left for tourists to gawp at, preserved for aesthetics. By car the journey takes just a little over two hours, but the train carriages wistfully meander through the hills to allow one to fully take in the splendour of their surroundings. There is only one train line and so only one set of carriages can make the journey at any one time, past the West Highland Way and into the “wilderness”. The rails nostalgically clickity-clack underneath as mist lingers and highland springs gracefully trickle down the hills. Tourists excitedly chatter as the Glenfinnan Viaduct creeps into view, a historic piece of industry made particularly famous by its appearance in Hollywood flicks. Ancient boulders carried south by collapsing glaciers lay dispersed on the hills like clothing scattered from a dying man sweltering under a brutal sun. Nearby, hewn stones mark out the rubble of tiny dwellings, the picked-clean carcasses of long-lost Highland communities. Meanwhile, at the bottom of the Glen, next to a Loch, a manor house stands cocksure and regal in garish juxtaposition from the landscape surrounding it: Lord of all it surveys with all outside a playground. A Monarch in the Glen. I spend the next few days, via a few ferries and hikes, looking at rural power systems on and off the West coast. Infrastructure isn’t profitable here because the economies of scale simply don’t exist. Locals frequently make do with what they have — a motley mix of diesel generators, tiny hydro schemes, solar, and wind- which allow these communities modern appliances and creature comforts where in the past you’d have to make do with a diesel genny and only 5 or 6 hours of light an evening. In places like Eigg, community trusts fund and maintain the power systems with community benefits. These are supported by Government grants by schemes like CARES and help provide jobs and amenities to local populations. A connection to the main GB network would cost at least 2 or 3 times the entire network cost for the microgrid on the Isle with none of the independence community ownership brings, so the people simply did it themselves. They still rely on the massive power companies for support — parts, maintenance, and construction are not resources or skills readily available in the far North-West, and repairs can take weeks as these frequently have to be sourced externally. But it works. The engineering is jury-rigged and maintaining it is akin to “nailing jeely tae a wa’ ”, but it works. Without these communities taking the initiative they would be left to wither and collapse. I sit on the opposite side of the carriage on the way home. I’ve a few tins of cider to pass the time and my pal’s brought a pack of cards. We discuss the trip and its outcomes. My heart aches. The glory of the landscape around me overshadowed by the lost human potential and history trampled underfoot. In cities we celebrate our lost industrial heritage — the great cranes in cities like Glasgow or collieries of Northern England, Wales and Southern Scotland stand both in memorial and celebration. We remember the communities surrounding these industries and what was lost. The anger burns in the remains of these cultural loci and in the hearts of those who were there to witness its destruction. In Highland Scotland, the landlords who scattered the communities have statues built of them looking regally into the sea; they stand proudly in resplendent alabaster utterly unaware, or uncaring, of the carnage and bloodshed wrought in their name. We celebrate the emptiness and wildness of land where people used to live and work. We call it “Wild Land” and hillwalkers in Edinburgh and landlords in London ensure the land stays bare and undeveloped; pretty as a picture. Post-industrial cities like Liverpool, Glasgow, and Dundee get regenerated; cladding, glass, and chrome replace redbrick. The Highlands and Islands are kept as a snowglobe with any minor alteration viciously opposed by those living hundreds of miles away in townhouses with a few acres of land. Half of Scotland is owned by around 600 people, the land burned so as to allow rich people to go hunting for birds or kept for farm animals and photographers to enjoy. Development of job-creating wind-farms is opposed by those with little or no stake in the area beyond desiring that a place hundreds of miles from them remains as they wish it to be- a playground to visit with gun in hand and tweed upon their back. As politicians in London bicker over immigration, a vast area of land forcibly emptied lays bare as local communities wither. Land cleared by the rich is not wild, it is hoarded. Ancient, empty farmland is not wild, it is neglected. Highland Scotland is not a playground for the rich — it is a place where people lived and worked, and where the people that remain deserve better than what is left to them by cities, businessmen, and lardlords. When I returned to London, I sat on the Hammersmith and City line, staring out the window. I live in West London, and my route home took me through Kensington. I sat, chilled to the bone, as I got further West and neared my destination. The entire carriage fell under an uneasy silence as we approached Latimer Road. I gazed out at the tower blocks and cranes around me — the concrete, glass, and chrome that had angered me so but a few hours ago. There it was — Grenfell. At least 79 dead- and, in reality, it could possibly be as many as triple that. An entire community in a tower block lay in charred ruins because someone, somewhere, wanted to save money. Whether that be on sprinklers or fireproof cladding, scores of people lost their home, community, loved ones, or life itself, to save money. My anger at cities was then tempered. It is not simply rural versus city- it is rich versus poor. It is investors scraping all they can from those at the mercy of their cost-cutting and negligence. Whether Grenfell was covered in combustible cladding to keep nearby rich residents happy or to keep a bottom line happy, vulnerable people died over money. Communities were destroyed over money. As you come out of Wood Lane station, you stand opposite what used to be the BBC Television Centre, now being converted into high-end apartments which will never be affordable for most of the people living in Hammersmith and Shepherd’s Bush. Next to you is the Westfield Shopping Centre, full of shops selling things most of London will also never be able to afford. The gross inequities of city life laid bare with lives and communities destroyed to appease those with at the expense of those without. The Laird and the pauper live much closer in a city, but the injustice remains. It is simply easier to hide injustice in an area where the remains of life can be portrayed as a feature, rather than a blemish. The illustration is by Murray Robertson, more details of a recent exhibition of his here. You can follow the author at @Magnus_Jamieson and on Medium here. Thanks for that post. Here in Argyll, the people who really try to improve things here and get things done tend to be the workers and people who have lived, farmed and worked the land for generations. The ones who oppose any, and it seems, all schemes locally are rich landowners who are rarely here unless it’s to pick up money or rich retirees from the cities up here to as one put it to me to “show you Scots how to be civilised!” Don’t get me wrong there are just as many “proud Scots but…” here too from the Cities. It is,however, a terrific place to raise a family. We try very hard to improve the area and enjoy what we have. We don’t strive for much but would love more devolution of power down to local communities to help regenerate in a sustainable manner. Good you made the connection between the ravaged landscape of the Highlands and Grenfell. Not many do. It is the beginning of consciousness. Something the Tories want us to forego. landscapes are beautiful. To me they have always been desolate and unnatural. When landowners tell us that without their management they would just revert to ‘scrub’, I think yes that would be so much more attractive and support more diverse wildlife. After all what is scrub but trees, bushes and other wild plants. And as for blanket forestry-what a blight on the landscape! I think if people were really aware of some of the forms of ‘management’ that take place-the killing of animals such as mountain hares and other native animals that you might actually like to see in your own country, just so that some toffs can shoot some poor birds that happen to fly in a particular way that turns out to be their downfall(literally), then there would be more pressure to change things and Scotland could thrive again in a different way. We just accept that shooting and fishing brings in money but with a little imagination, it could be profitable in more diverse ways. As you point out,it is the very rich who make the rules and profit from the rest of us. Good piece Magnus. The emptiness and the declining populations are the challenge. And there is only one way to stop this rot, the breaking up of the very large estates. Many more people need to own farms, crofts and community land. Control and a stake in your future is what encourages young people to hang around or come back home. It just isn’t attractive anymore to have an estate factor demanding rent on diversification or enterprise. Yes they are entitled to collect rental, but when they own virtually every square inch of a community, people and ideas just drift away. And to make things worse they kill our wildlife for fun! With the ludicrous claim that it is tradition or a heritage that must be protected. There is so much more that can be done with our landscape. First though, we need to stop pretending that these estates are the life blood of our remote areas. Still waiting on our SNP bravehearts at Holyrood introducing some radical legislation on land ownership or usage. But no one is holding their breath. If it ever happens it will be unlikely to frighten the lairds. (Meanwhile, congrats on super bit of artwork at top of Magnus`s piece by Scots artist Murray Robertson). The Scottish Government has, at least, established the Scottish Land Commission ‘to provide direction, leadership and strategic thought to land reform’. We must hope that that bears fruit. There is also a Scottish Language Minister, but aye yet nae Scots langage taught tae ony Scots bairns in schuil. No doubt our anglicised Whitehall appointed elite civil servants will hold back any meaningful Scottish land or Scots language reforms – they have been doing it for long enough. Part of the problem is that the landowners have their property rights enshrined in human rights legislation which also protects us little people. So truly radical reform is simply not possible. There is legislation which means when estates are put up for sale local communities have to have the opportunity to bid for all or part of it, supported with public funds. There was the recent change to make the ‘sporting’ estates pay rural rates again which may well hit the economies of many such places causing sell offs and opportunity. But the real change is little recognised but truly revolutionary. Scots Inheritance Law was changed so no longer can one heir inherit all. Now all heirs must have equal shares, in money or kind. No more heirs and a spare, both must be heirs. This will, over generation time break up the big estates passed on by inheritance. Those passed on by sale will remain vulnerable to local bid. Inherited estates broken up with half sold to pay an uninterested in land heir can also be bought thus. An LVT is still entirely possible and done properly will make it more expensive to own large amounts of land which is not productive enough to more than cover the tax due. Taxes due can be made payable only by the beneficial owner, flushing out those hiding behind Delaware etc companies. That is one big weapon we can wield which might have to wait for Independence. Making it more expensive to hold land is not a challenge to private property. It hits the suburban house with a big garden and the farmer as much as the big estates. A farmer though has the opportunity to generate income to cover the tax as they do rates now. The ability of the estates, many of which run at a loss now, to cover a major tax increase is in doubt. Those buying estate land for development will be looking to use the land to generate income, which can cover taxes. So breaking up the estates with an LVT will regenerate the Highlands and Islands with enterprise. Which is why we need to continue to pressure the SNP and Greens etc on the issue. Well said Muscleguy & pleased to see you’re still around. You are right-our hands are pretty much tied until we have indy & then watch & be part of the change as the demand for land reform builds. Planting of indigenous trees instead of straight rows of pines for mile after mile would encourage the return of those species not yet hunted out of existence. Otters have been reintroduced into the wild-why not all the other missing species including man who cares for the landscape, it’s health & it’s diversity. We can live without the lairds hoarding the land-such a selfish act with something they don’t own but are only custodians of who prove year in year out that they are custodians of their own wealth & the land & its natural occupants don’t matter. Roll on indy is all I can say then the much needed work can begin. Excellently written. Has there ever been a better opportunity for meaningful land reform? And are we not utterly wasting this by being afraid to take on the establishment? My thoughts exactly – ” They make a desolation and call it peace” ( Tacitus). Preserving the land as a “wilderness” or as “wild land” for the benefit of jaded city or ex city dwellers is just as bad as the prevention of repopulation of the land when sheep farms were replaced by deer “forests” – which are still here. I’m all for wind farms – they are beautiful. Picture credit? I really like that image. Its a poverty of imagination in a sense, a lack of understanding that it can be any other way. I also think the victors have pushed their vision, very recent land use, as the only ‘tradition’ Landseer, Monarch of the Glen etc. But with large tracts of Scots who were never taught the history of their landscape (including my 40 year old husband who was taught about the Tudors but not the Clearances at school in Oban High in the 80s) how can another vision of life in the vast land area of Scotland be contemplated? I am English, wooed by the vast emptiness for climbing but now 20 years later and I have finally understood the history of this wonderful place a bit better (god love Mr Wrightmans books). I think Scotland will be a success when there are lights on in the glens and straths. The relatively recent ‘Out of Doors’ series of broadcasts from southern Norway was really interesting about how the Norwegians have managed policy to keep their landscape lived in. Sàr dhealbh dhà-riribh. Superb artwork and article. Thank you for this. Many years ago (about 30! ), the editor of either the Helensburgh Advertiser or the Lennox Herald (can’t remember which) declared in an editorial that if Faslane Submarine Base closed, Helensburgh would be ‘reduced to tourism, farming and fishing’ and I just thought ‘And what’s so bad about that?’ Because, yes, it’s so much better to be living in a town that has an economy entrenched in a military-industrial complex which is totally focused on a defence system based on weapons of mass destruction – NOT! I think there is a hidden psychological hurt that happens in communities that ‘host’ places like Faslane (or Dounreay/Sellafield/etc.) – there are huge numbers of people here who shrug off the threat of total annihilation (‘weel, at least I won’t know what happens, ’cause I’ll be obliterated’), or who work in the base, because they need the money, but think the whole raison d’etre of the base is abhorrent, So every day these people go to work in a place they think is useless, dangerous, scarey (both because of everyday radiation effects and possible nuclear annihilation) and they come home to families and loved ones and cannot express their fear and anxiety. How does this link in with empty straths and glens? Because again, people are working in straths and glens knowing that things could be so much better. Granted, they’re not working in situations where the danger is so acute- but the powers that be insist that depopulated areas that will accommodate grouse shooters are better than straths and glens full of people bringing the land back to life. People who want to rid the world of nuclear weapons are laughed at as dreamers, as are people who want to bring new verve to Scotland’s life-stripped glens – but these dreamers envision a new reality that our ‘masters’ actively repress, as they fear our determination. More good reading from Bella. My own comment after a recent trip back to Scotland is that central Edinburgh looks like a tartan clad resort for tourists who don’t care to know the real Scotland. It must be a great asset on the uk government spreadsheet- perhaps another reason to oppose Indyref2? Very sad to see it’s come to this. This ‘real Scotland’ what is it then? As a tourist about to ‘do’ Scotland I’ve got reasons to go there and buying a tartan in the Long Mile and tea towel from Inverness isn’t one of them. As a keen lay student of history I’m there to look for the things I’ve read in the books and seen on the TV and read on the net. So not all tourists are uncaring or ignorant of the past or indeed the present and understanding why the referendum failed and then a few years later the SNP get up and storm the election winning nearly everything and then they lose a swag of seats to the Tories in the recent election and the chances of an indy Scotland recede once again seemingly. That’s the kind of stuff I’d like to find about in my upcoming trip as well as the sightseeing up in the western highlands. *I’ve read mentioned that Scotland’s paltry population of 5 million odd is reason enough not to break the Union and how would an indy Scotland survive without the economic clout of Britain. I immediately think of New Zealand a country similar in population with wild parts and extreme temperatures ect and yet they do it and they do it very very well so why can’t Scotland? interesting topic and one close to my heart as a Hebridean. I agree wholeheartedly with the notion that the land has been diminished by management over many generations. That’s not just about landlordism, sheep ranches and deer forests but that’s a big part of it right enough. What we have now could be so much more but that’s not to say there is not value in looking after what we have now. There are areas that feel wild here not in the sense they are untouched by mankind but in so far as they offer people space and an opportunity for peace (and many other benefits). It’d perhaps be misrepresenting the above article as a call to industrialise the highlands and islands so as to bring the ‘benefits’ of modern life to us – but we should be aware of simplistic responses of that kind. Too many white elephants bear testament to previously well intentioned development schemes that once shorn of public subsidy were never serious propositions that would last. Yes we should be looking for opportunities to secure and create sustainable and vibrant communities across the region but that is unlikely to be derived by turning these hills and islands into a powerplant to service urban energy demand. We should provide communities with a voice and empower them to grasp the opportunities they want. We should not being caricatured as the impoverished remnants of injustice that need saved by making here like everywhere else. Excellent, I’ve long shared similar feelings. But beware of welcoming all development, ask who benefits, who controls it and where do the profits flow to? Is it regenerative or extractive? I remember looking at a massive wind farm and discussing our reaction. We decided the “visual impact” largely depended on who owned it – and we didn’t know! Excellent and thought-provocative. It brings up many points of discussion – who tells us to stop erection of wind-turbines, why is land reform so difficult, and the discussion has to start with the fact that Scotland has got itself in a situation where less than 400 own half of our Nation’s private land, in the process reducing much of it to desert, and wolves, much of our flora and fauna, and poor people who got in the way and had to be ‘removed’? Part of the issue is the part – many see this as an important part – Tourism plays in the prostitution of a country’s culture and environment which is often excused in the interests of the Nation’s economy. So much of world tourism lives off ‘man-made’ environment. Think New York, Paris, Singapore and improbably, Dubai! Scottish castles and barren mountains landscapes attract the dollars, much in the same way as do Anchor Wat, Machu Picchu, rice-field terraces in Bagulo, Philippines and Bali temples. Have we the wit and see the real urgent need to hold a ‘charrette’ – a meeting of all parties and set the plan for the regeneration and management for the next generation – ‘STRATEGY SCOTLAND 2050’? I see very little chance of meaningful progress based on 5 year election manifestoes. Good article I think but “hillwalkers in Edinburgh … ensure the land stays bare and undeveloped”. If I could be bothered getting off my arse and up the hills I would, but I’m genuinely curious to know- what development has been stopped by hillwalkers? I hope you have enough Gaelic to follow this poem about the Duke of Sutherland’s massive statue dominating the hilltop and skyline near Dornoch. which will one day make of you a memorial candle. le sùilean-cloiche spìocach gun aithreachas. gan sìor leagail gun rian san t-seòl-mhara. a nì coinneal-cuimhne dhìot là dhe na làithean. Thèid d’ ìomhaigh rìomhach a thalmhachadh fhathast! Sorry. English given for last three lines, not four. Living amongst it and being a community advocate I’m very close to your thinking here, Magnus. Thanks for giving credit to places like Eigg. The points you make centre on the reason we set up the East Lochaber and Laggan Community Trust to strive to buy the former Alcan Estate: http://www.eastlochaberlaggan.scot We continue to work with the new owner on this. I hope other communities feel inspired by your article. Well done Bella for sourcing this!